Nate Shawcross is perfectly content to spend his days training wild horses, but after his ambitious ex-girlfriend distributes brochures behind his back, horse lovers from all over the country are arriving at the ranch expecting a three-week workshop. When a beautiful greenhorn unexpectedly shows up for a seminar from the famous "Horse Whisperer" of Wyoming, all Nate wants to do is send her packing-until an impending foreclosure makes him willing to do anything to save his horses. 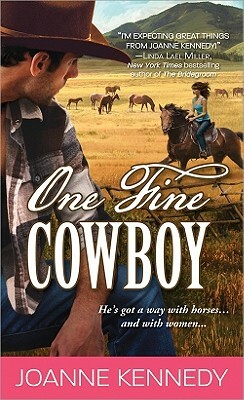 Graduate student and East Coast animal rights activist Charlie Banks is skeptical that a rough and tumble cowboy can teach her anything about animal behavior, but as she watches Nate work, the horse isn't the only one who succumbs to the handsome cowboy's "whispering." Could it be that after all this time Nate has finally found the one woman who can tame his wild heart? Joanne Kennedy has worked in bookstores all her life in positions from bookseller to buyer. A member of Romance Writers of America and Rocky Mountain Fiction Writers, she won first place in the Colorado Gold Writing Contest and second in the Heart of the Rockies contest. Joanne lives in Cheyenne, Wyoming.